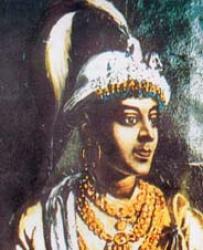 Prithvi Narayan Shah, with whom the modern period of Nepal's history begins, was the ninth generation descendant of Dravya Shah ( 1559-1570 A.D.) , the founder of the ruling house of Gorkha. Prithvi Narayan Shah succeeded his father King Nara Bhupal Shah to the throne of Gorkha in 1743 A.D. Sagacious and far-sighted, King Prithvi Narayan Shah was quite aware of the political situation of the valley kingdoms as well as of the Baisi and Chaubisi principalities. He foresaw the need for unifying the small principalities as an urgent condition for survival in the future and set himself to the task accordingly. His assessment of the situation among the hill principalities was correct, and the principalities were brought under control. King Prithvi Narayan Shah's successful entry began with the union of Nuwakot, which lies between Kathmandu and Gorkha, in 1744 A.D. After Nuwakot, he took possession of strategic points in the hills surrounding the Kathmandu Valley. The Valley's communications with the outside world were thus cut off. The occupation of the Kuti Pass in about 1756 A.D. stopped the valley's trade with Tibet. 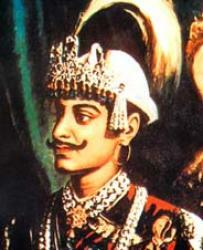 Finally, King Prithvi Narayan Shah entered the Valley, after glorious unification of Kirtipur. Consequently Jaya Prakash Malla of Kathmandu managed to escape with his life and took asylum in Patan. When the unification was extended to Patan a few weeks later both Jaya Prakash Malla and the King of Patan, Tej Narsingh Malla, took refuge in Bhaktapur, which was also unified after some time. 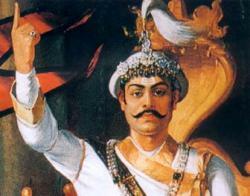 Thus King Prithvi Narayan Shah unified the Kathmandu Valley and Kathmandu became the capital of the modern Nepal by 1769 A.D. Once the foundation of the Kingdom of Nepal was thus laid, King Prithvi Narayan Shah, turned his attention towards the east. The Sena Kingdom of Choudandi was united by 1773 A.D. and Vijaypur, another Sena Kingdom was annexed shortly after. 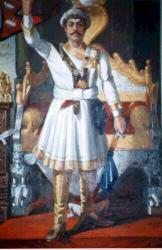 King Prithvi Narayan Shah passed away in January, 1775 A.D. at the age of 52. The Kingdom of Nepal, which he founded, extended to the Marsyandi river in the west and to the Mechi and Kankai rivers in the east and comprised more than one third of the present territory of the Kingdom of Nepal. King Prithvi Narayan Shah, The Great, by his tireless efforts was successful in bringing together diverse religio-ethnic groups under one national banner and inculcating in them a sense of national pride and belonging. He was a true nationalist in his outlook and was in favour of adopting a closed-door policy with regard to the British. Not only his social and economic views guided the country's socio-economic course for a long time, his use of the imagery," a yam between two boulders" in Nepal's geo-political context, formed the principal guideline of the country's foreign policy for future centuries. King Prithvi Narayan Shah was indeed " The Founder of the Nation," who had a vision not only for individual tryst with destiny but also for the national goal of peace and prosperity. He maintained friendly relations with neighboring states and countries. Waged a war with Sikkim but failed to conquer it. He also commenced the custom of erecting a Linga (pillar) in the occasion of Indrajatra festival at Hanuman Dhoka Durbar. He helped in organizing a conference of Sanskrit scholars at Balaju in which scholars from 12 countries participated. Was made king at the age of 2. The valiant Damodar and Amar Singh Thapa invaded Garhwal, Almorah and Kumaon, and annexed them to the Kingdom of Nepal. The Kingdom of Nepal's border extended from Kashmir to Sikkim, from the Himalayas to the border of Agra, Bihar and Bengal to the South. After the death of Kantiwati, the king became mad with sorrow. He smashed many idols to pieces including Taleju. The rate of interest was fixed for taking loans. Several laws for the development of trade and industry were made. He successfully reformed the system of measurements. Dharahara and Sundhara were built. 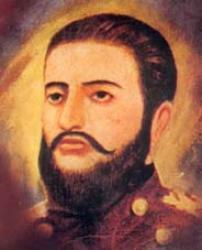 Rana Bahadur was stabbed to death by Sher Bahadur (his step brother) in 1860 AD. He was also made king at a very young age and died young. There were a lot of battles in his rule. 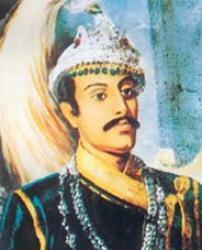 Nepali fought British and were forced to sign Sugauli treaty in favor of British, and Nepal suffered a great loss. 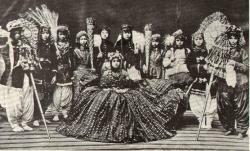 In 1846, Queen Rajendralakshmi plotted to overthrow Jang Bahadur, a fast-rising military leader who was presenting a threat to her power. The plot was uncovered and the queen had several hundred princes and chieftains executed after an armed clash between military personnel and administrators loyal to the queen. This came to be known as the Kot Massacre. 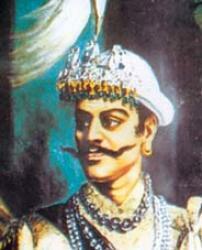 However, Bahadur emerged victorious and founded the Rana lineage. 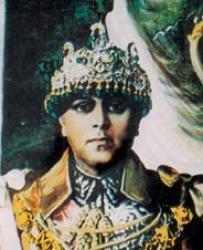 The king was made a titular figure, and the post of Prime Minister was made powerful and hereditary. * Slavery was abolished and roads were constructed started for travelers. * The Cot massacre , the Bhandarkhar event and the Alou event took place. 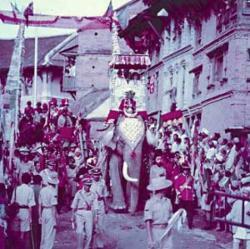 * The start of Rana regime. * Emphasis was given to inoculating children against small-pox. * English education was introduced in Nepal. The Ranas were staunchly pro-British, and assisted the British during the Sepoy Rebellion in 1857, and later in both World Wars. In 1923 the Britain and Nepal formally signed an agreement of friendship, in which Nepal's independence was recognised by the British. Roads from Kathmandu to Birjung and Bhaktapur to Thankot were built. The first census was taken. The practice of taking life of women on charges of witchcraft was abolished. 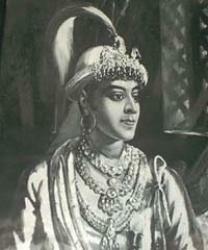 Trailokya Bikram Shah died young and couldn't become a king. However, his son was made the next king. * Assassination of Ranodwip Singh. * Good supply of water and strict sanitary systems were applied. * The first automobile was brought in Nepal. * Improvement in military and judicial administration. * Along with slavery system, Sati custom was also abolished. * Nepal was recognized as an independent sovereign country. * A dreadful earthquake occurred which caused a heavy loss of life and wealth. * Nepal took part in the World War in favor of British. * Great patriots, Dharma Bhakta, Sukraraj Shastri, Dashrath Chand and Ganga lal Shrestha were sentenced to death. * High court was established. * Several schools and colleges were established. * Rana autocracy reached its end. 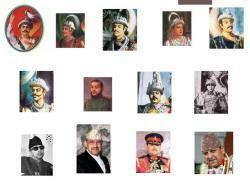 * Several parties were established to end the Rana regime. * Delhi agreement (for the formation of a new ministry under the king's leadership) was signed. 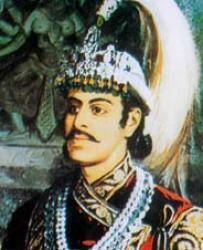 Tribhuvan Bir Bikram Shah is remembered in the history of Nepal as the king who overthrew the autocratic Rana regime. Although sporadic public protests against the despotic Rana rulers were emerging in the country, the citizens of Nepal were not powerful enough to fight the oppressive force. 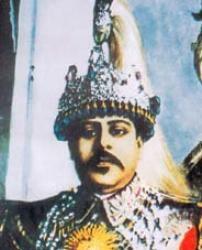 King Tribhuvan took the bold action of openly defying the regime. His escape to India from internal captivity back home spurred a mass revolution in 2007 BS (1951 AD), which finally succeeded in ousting the Ranas from power. The result was the establishment of the first democratic government of Nepal. The event used to be celebrated as the National Democracy Day.... is it still ?? 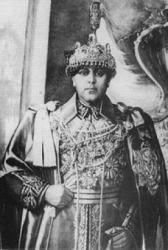 Mahendra Bir Bikram Shah Dev, was King of Nepal from June 11, 1920 - January 31, 1972. He was also made a British Field Marshal in 1960. He succeeded his father, Tribhuvan, who had, after years as a puppet of the Rana family, finally managed to break their more than 100-year hegemony over the country. The pace set by King Mahendra when he introduced the Panchayat system in 1960, had dissipated by the second decade of his son's reign in the 1980s. The economy was stagnant, environmental destruction had accelerated, Kath-mandu Valley succumbed to uncontrolled urbanisation, the bureaucracy evolved into a clique of corrupt yes-men, and the educational system from primary schools to the university was a mess. The only area where the government was truly energetic was in moving amongst the donor countries, begging bowl in hand. Page created in 0.64 seconds with 20 queries.